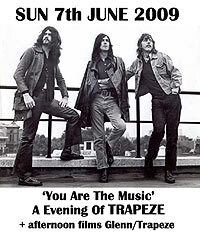 "As a tribute to the late guitarist Mel Galley, Glenn Hughes and band played a full set of Trapeze material last night (first time since 1994 for Glenn, I reckon) - and mighty fine it was too! I must admit, I had doubts about guitarist Jeff Kollman's ability to emulate Mel's feel prior to the show (great guitarist though Jeff is, it was his style I was uncertain of). Anyway, any such doubts were dispelled during the opening moments of the first song Way Back To The Bone - Jeff was great, as were drummer Steve Stephens and keyboard player Anders Olinder. As for Glenn - wow, what can you say. Clearly an emotional night for him - I was close enough to see a tear in his eye as he kissed Mel's 'Black Beauty' guitar after playing 3 songs on it (and he brought a tear to mine with Coast To Coast). The set-list was something like this (*Glenn on guitar):- Way Back To The Bone / Touch My Life / Jury / Keepin Time / Coast To Coast* / Seafull* / Good Love* / Your Love Is Alright / Medusa / You Are The Music. Encore: Black Cloud Good Love (from 'Final Swing') was a nice surprise, with Glenn managing the edgy guitar licks with seeming ease. Keepin Time just exploded from the speakers. Other highlights included a couple of extended jam sequences, with the band going wherever the mood took them (and clearly impressing Glenn - and the audience - in the process). Oh yes, and I even got one of Glenn's plectrums too. A great concert." Glenn also played a show at the Robin 2 on Saturday, June 6th, consisting of solo material interspersed with Deep Purple tracks. According to Ian Prentice "it included both 'Sail Away' and 'What's Going on Here' from 'Burn'. Interesting bit is that the show was recorded for mixing and - they said - a free download!" "GLENN is encompassing some brilliant new tools that will see a link between the official Glenn Hughes site, a fully functional DIGITAL ONLINE STORE and the (NFF) ALIVE DRIVE. The ALIVE DRIVE will go on sale at Glenn's ROBIN gigs from 6th June. The exciting mechanism here is that the live shows will be made available going forward, utilising the drive as the operating system. The ALIVE DRIVE will provide users with 4-6 free concert downloads per year as well as news and special features -making it an incredible package , and unparalleled value for money, for all fans." "Glenn Hughes' band were "Come Taste the Band" (or CTTB for short!). 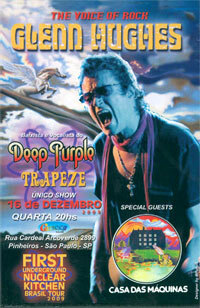 Glenn Hughes said that he was touring Norway to celebrate the songs of Deep Purple Mk 3/4 and to have fun. Come Taste The Band opened the show with the riff from "Stormbringer", before Glenn Hughes stepped out on stage dressed all in black, shouldering a white Fender Precision bass, and tore into the first verse. The crowd exploded, it was a fantastic opening. Next up was "Might Just Take Your Llife"). The band enjoyed a good sound during the show and performed with great energy. Everybody was enjoying themselves. Glenn's bass sound was good and his voice was great. Other songs at the concert included "Sail Away", "You Fool No One", "Mistreated", "Gettin' Tighter", "Love Child", and "You Keep On Moving". The encore was "Soul Mover" (the only song from one of Glenn's solo albums) and "Burn". The show also included drum, organ and bass solo spots. 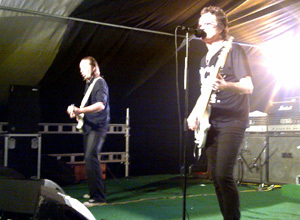 Glenn Hughes looked really well, played really well, and seemed to be very much enjoying himself in Haugesund. Before he left the stage he said: "next time I see you, just call med papa". Make of that what you will!" "The club was the perfect setting for creating an almost family atmosphere. The attendance wasn't massive but I think the level of enthusiasm made it feel as if there were hundreds of Hughes hungry freaks present. Glenn was thin, slick, dressed all in black, and moved like a voodoo dancer. It’s difficult to describe just how great it was to see Glenn enjoying the reaction from the audience. Deep Purple Mk3 & 4 have a massive following in Poland, and when "Sail Away" blasted off some guys went completely ape****, never having heard the song live before. Glenn turned the spotlight on his new guitarist - Soran Anderson. Well, what can I say - it's easy to understand Glenn's excitement about his new axeman. Soran blew my mind. He blends the styles of his guitar favourites (who must surely include Blackmore and Bolin) with the clear, gritty tone of his veteran Stratocaster. "Gettin' Tighter" was massive. 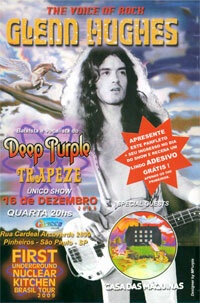 It was preceded by an introduction relating how Tommy Bolin was chosen in favour of Dave Clempson for Deep Purple Mk4. The song broke into a lengthy jam involving bits of the legendary "You Gotta Dance To The Rock And Roll". Glenn exchanged the guitars with Soran, and dedicated the next song to a bunch of Polish fans. Krystyna, Joanna, Janusz and their friend Pawel used to go and see 70% of Hughes' shows in Europe. Sadly Pawel died in the car crash in 2006 while travelling to see Glenn in Prague. The lights dimmed and the quartet began a beautiful rendition of "Coast To Coast". Glenn looked truly comfortable with the Stratocaster, he even fancied a bit more than chording in the solo section - which was a real treat to see. Needless to say, he sang beautifully and with astonishing passion. The set: Crave / Might Just Take Your Life / Sail Away / Mistreated / Getting Tighter / Coast To Coast / Don't Let Me Bleed / Stormbringer / Holy Man / Steppin' Out / You Keep On Movin'. Encores: Soul Mover / Burn. SET LIST : Black Cloud / Coast to Coast / Nights in White Satin / I Found a Woman / Break for questions and answers. This Time Around / Sail Away / Will Our Love End? / Seafull / You Keep on Moving. Encore: Holy Man / Soul Mover. "An amazing and wonderfull show. 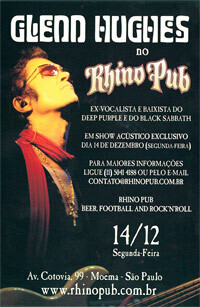 Glenn Hughes was in great form, and showed how happy he was to be in Brazil, This was a private show with an audience of only 150 people, and he surprised them by playing songs which he never played here before, such as Sail Away, Will Our Love End?, Seafull, Holy Man and Nights in White Satin." "Another great show, in front of a large audience. Glenn put in a really powerful performance, which showed just how brilliant a singer and bass player he is. God blees you Glenn, PLEASE COMEBACK SOON!!!!!!!" "Glenn played for about 100 minutes last night to a packed house odf 1,200 in São Paulo. Much better than his last visit back in 2007. Great night!" © 2009 DPAS / Darker Than Blue.